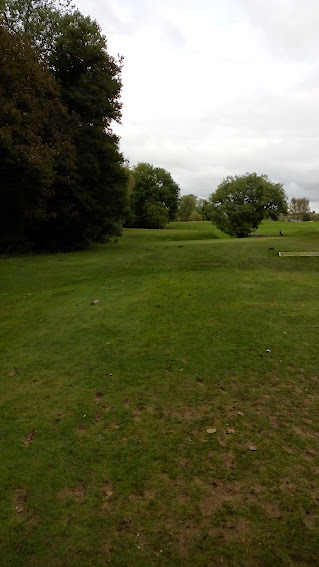 In my first post I mentioned that I learned to play golf at a pitch and putt in Ayr and then took my first tentative steps at the local “proper” course – Dalmilling in Ayr. It is not a famous course; it is a municipal run by South Ayrshire Council. Apparently a few years ago (I was living in Japan at the time so no first hand experience) SAC tried to close it down in a cost cutting exercise. I will not start on a critique of SAC otherwise I will be here all day but thankfully there was enough of an uproar from local people that sense was seen and the course remains open. To many of its detractors, Dalmilling is featureless or lacking in soul – I can see the argument but I don’t feel that way myself. 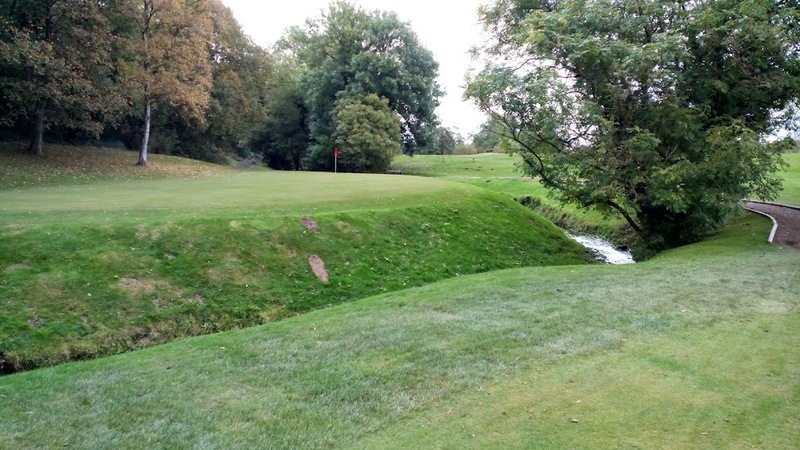 It might be that I am biased due to my emotional attachment – even before I ever played golf I frequently walked along the River Ayr next to the course and it plays a part in a lot of childhood memories. Whatever it is, I just really like Dalmilling. I won’t go through the whole course hole by hole – if you are interested in that level detail you can see the Strokesaver pictures on the Golf South Ayrshire website I’ve linked to. Instead I will talk about a few highlights and personal favourites. There are more reviews over on Golf Shake as well. The first hole is one of the longer ones on the course at 437 yards. Having said that, it is a par 5 so quite short for that number of strokes I guess. I know I am not able to reach the green in 2… It is a nice view from the tee, looking down hill to the green which is slightly to the right. As long as you have a reasonably straight drive you are unlikely to have any real problems with this hole- my biggest issues have been my horrible slice with my driver which leaves me in long rough, having to shoot over a hedge at the green. Oh, and one time there were neds on the fairway – I didn’t hit them, probably safest not to anger the natives. From the first it is a wee walk across a farm track to the best part of the course – holes 2 to 8. These are in an area next to the river Ayr. The 5th runs alongside the river so if you have a hook you might find yourself in trouble (I have never had that problem, what with my slice and all). For me the undisputed highlight of the course is the par 3 6th. At 113 yards a short one but it is such a fun hole. The tee off is right next to a tributary burn of the River Ayr – the burn winds its way around the green so it almost feels like an island. I have had a birdie on this hole once but equally I have put shots slightly off target just to see them trickle down the bank into the water! 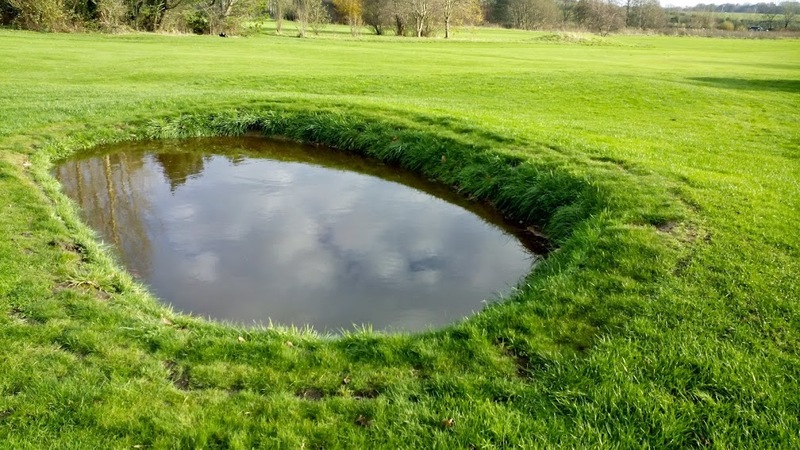 I haven’t played recently but did walk the dog past it yesterday and winter greens are in play – and on this hole it would completely ruin the whole fun of it – the winter green is a wee patch of grass about 70 yards from the tee on the same side of the water. After the par 3 fun of the 6th comes (according the Stroke Index) the hardest hole on the course – the massive dog leg of the 7th. The 13th is another par 3 and then we meet the second of the course’s par 5s. It is a nice drive down a fairway that slopes away from and then doglegs to the right back up a hill to the green nestled behind a wee copse of trees. To summarise, Dalmilling is a parkland course with a bit of interest provided by its riverside location (in some ways it reminds me of Girvan in that aspect). It is quite forgiving as the fairways are not tree lined and if you miss them you generally find yourself in no more trouble than some long rough. The front nine is definitely more interesting but the back is probably the more challenging in terms of distance. The greens are always (in my experience) in really good condition. The course itself can get a bit wet after (during) some rain but the greens seem to fare well. It definitely does not have the drainage enjoyed by the links at Troon (or the old racecourse side of Seafield) so if it has been raining make sure there are no holes in your shoes (or if you do, wear waterproof socks like me). I wouldn’t advocate coming to visit Ayr simply to play Dalmilling but I would absolutely suggest a round if you are not too far away. It is very accessible from the A77 so even worth a burl down from Glasgow perhaps? Unlike Troon it is not really accessible by train but it is only maybe 5 minutes from a major junction on the A77 if you are driving.